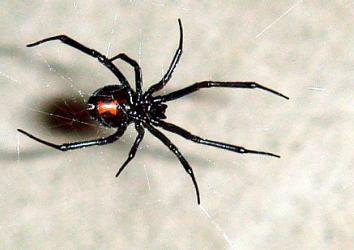 Black widow: What's it feel like to be bitten by the venomous spider? What Does a Black Widow Spider Bite Feel Like? It was a sunny Sunday morning in the summertime of 2006 in Redwood City, Calif., and the Mrs. was back East with her gal pals for a weekend of recharging her batteries and reconnecting with old friends. I was holding down the fort with the munchkins (boys 4 and 1¾), and in the interest of creating a morning diversion, we began to make preparations for a walk in the local hills. Sunscreen on, snacks loaded, water filled, stroller out—you know the drill. I grabbed a pair of old shoes from the garage and hastily threw them on over my bare feet, and I continued my charge around the house to build momentum to get out the door. About a minute later, I realized that there was some wiggling in the toes of my right shoe, and just as I was about to take my shoe off, I felt a prick on the tip of the second toe of my right foot—not painful, but it got my attention. I took my shoe off on the outside steps and dumped it out, discovering a jet-black inky spider with a body the size of an engorged pea. I instructed my son to grab his bug catcher, which was conveniently nearby, and I dumped the spider into the clear container for inspection. Imagine my horror when I rotated the container and got a glimpse of a distinct reddish-brown hourglass figure on the belly of the black black spider. OK, I reasoned, I’d lived in those parts for the better part of nearly four decades, and I’d never heard of anyone seeing (let alone getting bit by) a black widow spider, so presumably this is just a copy-cat spider that is harmless. Well, I suppose before heading out for a walk, I ought to be safe and call the urgent care and see what they think. After being reassured that there was “no way” I had been bitten by a black widow, the attending physician confessed that she was looking at information on Google (!!!) and started to ask me questions about what it looked like. After 20 minutes on the phone (with the boys starting to melt down) and getting on the Internet myself, I began to experience my first tell-tale symptom—a slight cramping in my lower right leg. At this point, the doctor changed position entirely and strongly recommended that I get medical attention immediately. OK, kids, time to pile into the wagon. We’re heading to the ER. Ten minutes later, I walked through the doors at the ER at Sequoia Hospital in Redwood City holding the hands of my two boys, along with the bug catcher. “Thirty minutes ago, this spider bit me on this toe, and now this leg is cramping,” I said. The otherwise bored doctors and nurses—numbed by their predictable flow of blunt trauma, heart palpitations, and other mundane dramas—rapidly appeared out of the woodwork and collectively shouted a big “Yeah!” This, they thought, was so cool. Note: Capturing and bringing in the actual spider was by far the smartest thing I did all day, as it brought me instant celebrity and credibility, as the bite itself was completely and somewhat disappointingly unremarkable. It was delicately but firmly suggested that I make some phone calls and line up some child care, as soon I’d be all jacked up full of morphine and other things that would make me a less-than-effective father. I was able to get ahold of my neighbor friends, who gamely dropped what they were doing and came to pick up my boys. We had a long discussion about how to orchestrate the movement of cars and car seats, including me driving their car home, which was completely naive given how messed up I was about to become. By now the cramping had migrated into my groin area, and I was beginning to wonder what was in store. I was told that an anti-venom does indeed exist, but it’s kept in Arizona and is highly toxic in and of itself, so they don’t fly that in unless I was otherwise at risk (toddler, elderly, poor immune system). So my fate was to get jacked up on opiates and survive the onslaught of the neurotoxin from the spider that would otherwise cause tremendous pain and cramping for the next six hours. At this point I texted my wife (who was on her way to the airport to come home from Boston): “Hey there. I’m in the ER. Got bitten by a black widow. Love ya.” So much for a relaxing end to her fun getaway. Several hours of mental bliss later, I was discharged from the ER and picked up by my dad, who took me to the pharmacy to pick up my meds (vicodin for pain, muscle relaxants). I was slurring words and otherwise out of it but happy to get home to relax. The next 48 hours were literally a blur. I barely remember any of that time and mentally lost track of days and hours. It freaked my wife out when I said I thought my mom had spent the night, so I guess I was hallucinating. We assumed at the time that the meds were the culprit, but now we’re pretty sure the delirium was a byproduct of the neurotoxins. The medical literature suggests that recovery happens within three to five days. Nights Three, Four, and Five were complete disasters for me. For some completely unknown reason, I was sweating profusely at night. As in literally soaking through my sheets and changing my sheets three times on one night and twice the next. Wet, not damp. Specifically, I was leaking sweat out of my legs. I’d wipe them off, and they’d bead up immediately. It was freaky, to say the least. Also, I was having trouble concentrating or being coherent for up to five days. Sleep was next to impossible, and I was getting worn down. I later learned my wife was doing her own Google searches to see what the risks were of permanent brain damage. And I think my life insurance was promptly renewed shortly thereafter. The doctors switched me over from vicodin to valium (one makes the pain go away, one makes you not care about the pain). Finally, I got a decent night sleep on Thursday and a good one on Friday. I awoke on Saturday morning (Day Six) feeling like a human being for the first time and proceeded to clean the garage like a freakin’ maniac. Upon further inspection of my shoe in question, I discovered that the spider was harboring an egg sac inside my shoe. How rude of me to put my foot in there. She was actually quite restrained in waiting so long to bite me, and it turns out that these deadly creatures are incredibly passive. This is why it’s so rare that a bite happens, as in fact, I discovered, these spiders are everywhere in the area where I was living. If this happens to you, hang in there and ride it out. You will get better, but it takes some time. When I returned to work, my co-workers had decorated my cubicle with all sorts of Spider-Man memorabilia and delighted in my misery. All in good fun. How does a spider decide where to put up its web? How does spider locomotion work? What is the cutest spider?